The goal of Unleashing Readers is to be a go-to resource for all levels of teachers who are looking to include engaging, thought-provoking literature and nonfiction in their classrooms. We work to specifically tailor our website to teachers’ needs. This would be a great choice to read aloud (in whole or excerpts) to all students in the class. We often suggest this category when the book has strong, widespread appeal to many types of students. This text would work very well for discussion within small groups. We often suggest this category when the book offers great points of discussion, but it might not appeal to every student in the class. There are many passages within the book that would be great for analysis, close read, or discussion in the classroom. We often suggest this category when a book has complex passages or great sections to teach literary elements to students or would be a wonderful mentor text. This would be a great addition to your classroom library. Often, these books fit well with a specific type of student, but we definitely think it is worth purchasing for your classroom. Click on any of the buttons above to see all of the reviews we’ve tagged with these recommendations. Every classroom is different, and therefore, our categories are mere suggestions. We encourage you to comment on a review if you feel a book might be used in other ways. We asked some of our favorite bloggers about their favorites within each of the categories, and they came up with some great suggestions! 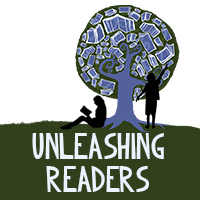 We hope that you find Unleashing Readers to be useful. Can your blog be followed by email? Hi, Dan! We are sorry for the delay as we worked on this. You will see a subscribe feature on the righthand panel! Thanks for stopping by!